The Square for Retail POS system includes robust inventory management tools – create purchase orders and manage your stock, right from your online Square Dashboard. If you’re new to Square for Retail, take a look at our comprehensive Getting Started Guide. The guide includes helpful tips for merchants who are new to the Square Point of Sale for Retail (but have experience using the Square Point of Sale app), as well as easy-to-follow onboarding steps for anyone brand new to Square. Note Square for Retail does not currently integrate with Bigcommerce. When you log in to Items tab on your online Square Dashboard, you’ll see the list of your inventory items. If you have multiple locations, the stock levels for each item variation will reflect the total amount of items, across all locations. Note: Before you begin managing your inventory, review creating items, managing modifiers and importing your item library. Click on any inventory item to see its variants, unit costs, SKUs, price, and current stock level. Click Actions > Transfer Inventory to move items individually or in bulk between locations. Navigate around your inventory management tools: click Inventory Management to view your vendors, create purchase orders, or view your stock action history. Manage Modifiers, Categories, Discounts, Taxes, Gift Cards, Dining Options as well as Comp and Void Settings. Log in to Items from the navigation pane. Click the name of the item to track > under Price and Inventory, click Stock. On the variation details page, each location will appear below. Toggle on each applicable location a location by enabling Tracking. 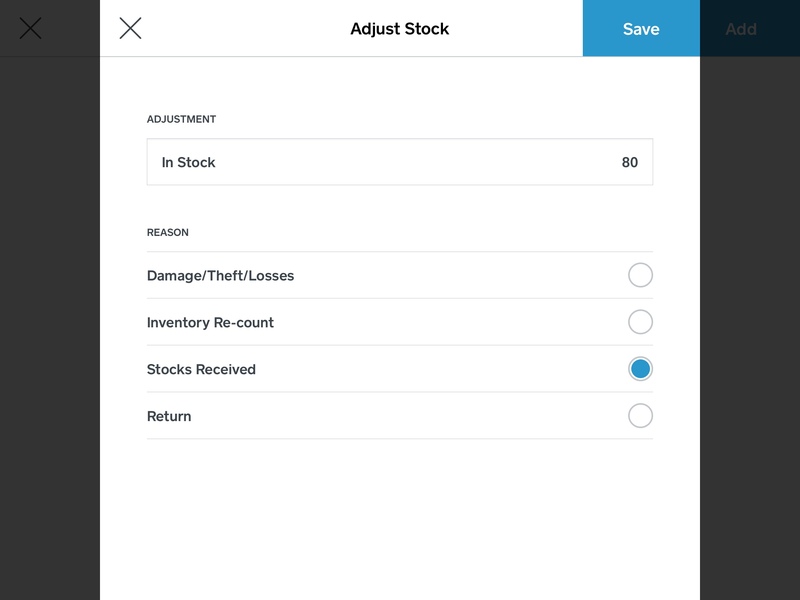 Select the stock action and enter the Current Stock amount. Enable Alerts and set a Low Stock Alert > Save. Log in to Inventory on your online Square Dashboard. Search for the item > click the variant to adjust. From the variation details page, update your stock by clicking Stock Action. Enable Alerts and set a Low Stock Alert > Done. Note: Stock Received, Inventory Recount, and Return will add to the adjusted stock amount — Damage, Theft, Loss will remove stock. Enter the item name into the search bar. When the item appears in the drop down > tap More Info. Locate the In Store section > tap Adjust Stock. Enter the new stock number, select a reason, tap Save. Note: There is a 25,000 item limit. If you need to transfer stock from one location to another, you can transfer individual items, or move your inventory in bulk — quickly and easily. Click Actions > Transfer Stock. From here you can begin your stock transfer. Select both the source and destination locations. Choose the items to transfer and enter the transfer quantity. Take note of the current source location stock levels to ensure you have enough stock to support the transfer. Once you complete the transfer, you can view the order information at any time — including location details, product name, date and time — all from your History log. Each transfer is assigned a unique transfer number to help identify past transfers. To filter your history to only view item transfers, click All Adjustment Types > deselect all filters except Transferred. Learn more about reporting with Square for Retail. With Square for Retail, you have access to three new, powerful reports: Cost of Goods Sold, Projected Profit, and Inventory by Category. Log in to your online Square Dashboard and navigate to Inventory and select the report you wish to view to get started. The Cost of Goods Sold report helps you keep an eye on your profit margin by keeping your topline metrics – cost of goods, total revenue, profit, and profit margin – front and center. Drill down deeper into your reporting by setting your desired filters and clicking Export to download a CSV. The COGS column will account for additional costs associated with an order. For example, when you receive a purchase order, you can choose to include shipping and handling by selecting Add Optional Fee. Including additional costs when receiving an order will increase visibility into your profit margin. Note: The Cost of Goods Sold report is calculated based on FIFO (first in, first out) sales of items received with an assigned cost. As a reminder, if you have questions about using Square for Retail reporting for tax or accounting purposes, please reach out to a tax professional. The Projected Profit report shows you the potential profit of your business inventory. Slice your data to see the performance of an item, view each location’s profit potential, and see how each inventory category is contributing to the strength of your business. The Projected Profit report is only updated once per day, and will not reflect changes in real time. The Inventory by Category report compares the data from the previous two reports to show the cumulative value of your inventory by category – it includes your total inventory value, potential profit, and profit margin by item category. Note on variably priced items: Variably priced items are included in your Inventory by Category and Projected Profit reports, but we do not provide projected margin since these reports reflect potential future sales. Once you sell a variably priced item at a fixed cost, the COGS report will reflect your profit margin. When you manually adjust your stock, accept a purchase order, or make a sale, your History log will reflect each adjustment. Your History log is intended to give you a detailed account of your current inventory levels by listing out each stock adjustment. Note: If your COGS, Projected Profit, or Inventory by Category report seem low, take a looks at your History log. You may have received stock or made an adjustment without an associated unit cost. You can update your unit cost for a historical adjustment from your History log to get back on track. Read more about Square for Retail advanced reporting.